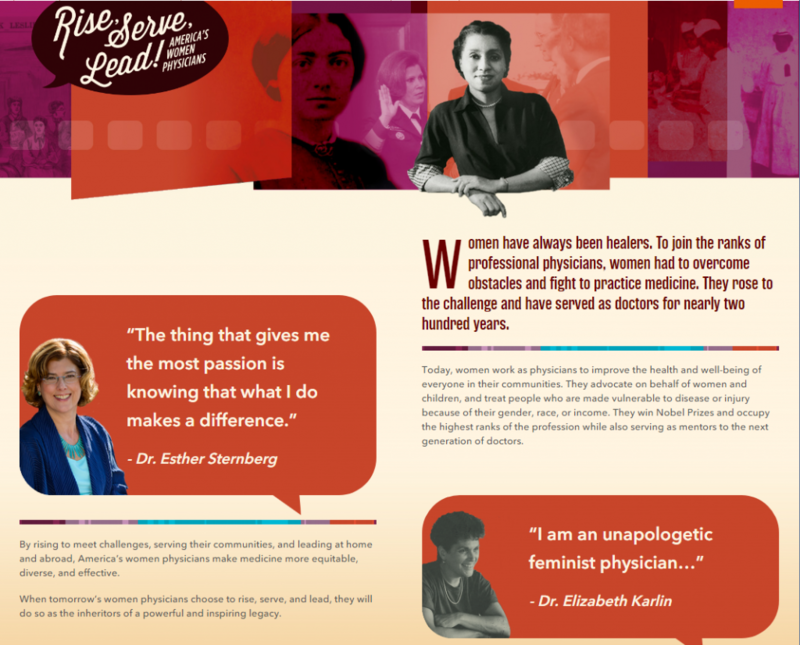 Women’s History Month – Changing the Face of Medicine and Rise, Serve, Lead! Elizabeth Blackwell was 28 years old when she graduated from medical school in 1849 and became the first woman to receive an MD. However, she was not allowed to practice medicine by the medical community. She and other women have faced many obstacles on their path to practicing medicine. The first Native American woman to receive a medical degree, Susan Le Flesche Picotte, was paid very little as a practicing physician on a reservation in comparison to a military doctor and would often have to pay out of her own pocket if the Bureau of Indian Affairs ran low on supplies. In 2017 more women than men entered medical school for the first time. However, many women physicians continue to face obstacles. One example is that women physicians who have families tend to shoulder more of the childcare and household duties compared to their male colleagues. Another factor is that more men are in leadership and administration roles as well as medical school faculty. Many female physicians face gender bias and discrimination from both their male colleagues and from patients. But some studies reveal that female physicians have better communication with their patients and better patient outcomes. Despite the growth of women in medicine, more progress is needed to continue to close the gender gap. The National Library of Medicine continues to offer its now retired exhibit, Changing the Face of Medicine: Celebrating America’s Women Physicians which honors the lives and achievements of women in medicine. Women physicians have excelled in many diverse medical careers. Some have advanced the field of surgery by developing innovative procedures. Some have won the Nobel prize. Others have brought new attention to the health and well-being of children. Many have reemphasized the art of healing and the roles of culture and spirituality in medicine. The National Library of Medicine honors the lives and accomplishments of these women in the hope of inspiring a new generation of medical pioneers through this online exhibition. The online exhibit features a number of engaging activities including a searchable directory of physicians by ethnicity, location, specialty and medical school. Short biographies and images of the featured physicians is included. Lesson plans for K-12 and higher education are readily available along with teacher resources. Online activities about the human body are available to learn how the body works but also highlights how physicians have improved our lives. Use this NLM exhibit resources to promote STEM and encourage students to enter the health professions, especially to increase the career opportunities for women and other underrepresented groups and therefore providing greater access to healthcare and healthier communities. NLM recently announced its newest exhibit, Rise, Serve, Lead! America’s Women Physicians which highlights the lives and achievements of over 300 women physicians who have made a difference through their medical practice and research, work as activists, service as administrators, and mentorship to the next generation of physicians. 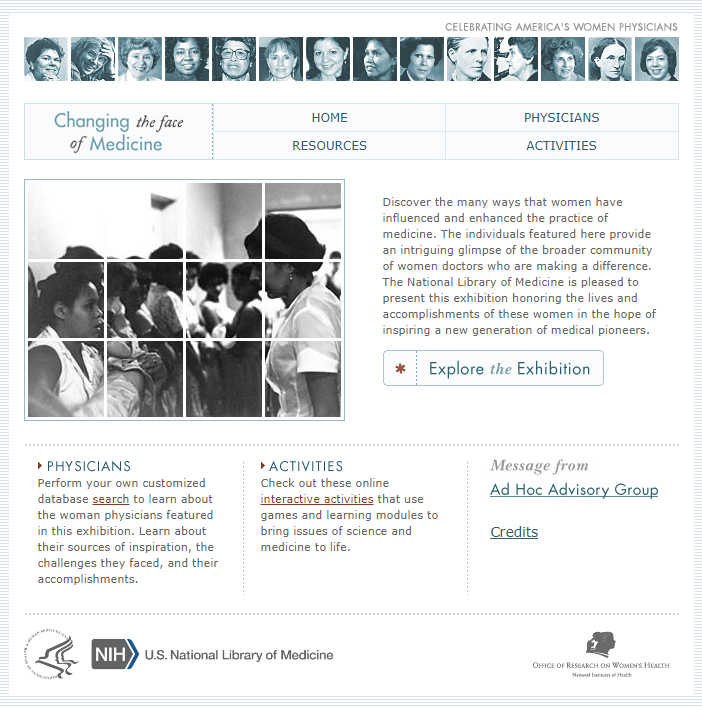 It presents a selection of the physician biographies featured in the 2003 NLM exhibition Changing the Face of Medicine: Celebrating America’s Women Physicians, showcasing the work of these doctors to connect to a contemporary audience. The online content of Rise, Serve, Lead! includes an education component featuring a new K-12 lesson plan and a digital gallery of works from NLM Digital Collections. These books and journal articles were authored by some of the doctors profiled in the exhibition and give a view into both their scientific research and experiences in a male-dominated field. Both exhibits highlight the contributions of women physicians and their persistence and dedication in a career field which was not often welcoming but which has greatly benefited from their presence. The staff of the National Network of Libraries of Medicine, Middle Atlantic Region, congratulates the recipients of awards and honors from our region of Delaware, New Jersey, New York and Pennsylvania. Awardees include NNLM MAR’s own Academic and Data Services Coordinator Elaina Vitale who was named a 2019-2020 “Rising Star”! Awardees will be recognized at the Medical Library Association Annual Meeting in Chicago, IL. For a complete list of awardees, go to the MLA website. While 70% of the global health workforce is made up of women, only 25% of the leadership in this field are women. Does this sound familiar? To some extent, it should: women represent 83% of the librarian workforce in academic libraries but only 60% of university library directors . Although data on health sciences library directors isn’t available, we know that women represent 87% of the health sciences librarian workforce but make almost 8% less than male counterparts in equivalent positions . This salary disparity cannot be explained by the commonly held belief that women are less likely to negotiate: research shows that when librarians in non-administrative roles negotiate salary, women are less successful than men . The conference artist illustrates a talk on #metoo and global health. With the help of a National Network of Libraries of Medicine – Pacific Southwest Region (NNLM PSR) professional development award and these figures in mind, I traveled to the Women Leaders in Global Health Conference at the London School of Hygiene & Tropical Medicine to learn more about the movement to empower women leaders in global health. Learning from internationally-known women leaders from places like WHO, the UN, MSF, The International Council of Nurses, public health schools at Harvard & Colombia, The Lancet, and various government organizations throughout Africa, Europe & South America was an incredible opportunity. Conference attendees learned about the scope of this problem worldwide and discussed potential solutions; this allowed me to think about ways to position myself to be an advocate for women in global health at my institution, and start thinking about how to address this issue within the field of Library Information Studies (LIS). I learned about organizations that exist to facilitate leadership abilities for women as well as additional tools and resources for people interested in contributing to research and scholarship in this field. Most of all, this conference confirmed for me that the issues of sexism, sexual harassment, and advancing women’s leadership are legitimate and important scholarly fields of inquiry. I was also inspired by ideas for actions that can be taken by anyone interested in helping to grow women leaders in their institution and their field. I intend to incorporate many into my own work, including actively encouraging and involving younger women in leadership; refusing to serve on panels that do not contain equal representations of men and women and rejecting conferences that support “manels”; encouraging researchers to disaggregate data by gender and race to help identify issues unique to different populations; recognizing how intersectionality and multiple identities affect women’s opportunities for and interest in leadership; and being mindful in the use of language that reinforces sexist, colonial hegemonies (e.g., instead of “giving someone a voice,” provide an opportunity for them to speak and use their own voice). Attending the conference reignited my passion for global health, and I have renewed my outreach efforts to our hospital’s Global Medicine division in order to become more involved with information provision around research and clinical work in this area. Finally, and perhaps most importantly, the conference advocated a key message: we cannot attempt to correct the gender disparities in leadership without considering the intersections of race, gender, and leadership. Out of the 60% of women academic library directors mentioned above, how many are white? One ARL publication suggests up to 94% ! We know that librarians are overwhelmingly white (up to 87% in some fields); it should not be a surprise to learn that women of color are underrepresented in library leadership positions and overrepresented in library staff (e.g., non-librarian) positions . In addition to creating space for younger women and those new to the field, white librarians must be mindful to do the same for women of color who are facing additional barriers in our predominantly white field. Thanks to NNLM PSR for supporting my attendance at this conference and showing support for women leaders in global health — and beyond! Lew S, Yousefi B. Feminists among us: Resistance and advocacy in library leadership. Sacramento, CA: Library Juice Press, 2017. Chou, RL, Pho A. Pushing the margins: women of color and intersectionality in LIS. Sacramento, CA: Library Juice Press, 2018. Galbraith Q, Kelley H, Groesbeck M. Is there a racial wage gap in research libraries? An analysis of ARL libraries. College & Research Libraries. 2018 Nov 1;79(7):863. Global Health 50/50. Global health 50/50 report. 2018. Association of Research Libraries (ARL). Annual salary survey (2009-10). 2010. Corcoran K, Medical Library Association. MLA compensation and benefits survey. 2013. Silva E, Galbraith Q. Salary negotiation patterns between women and men in academic libraries. College & Research Libraries. 2018 Apr 4;79(3):324. American Library Association. Diversity counts: 2012 update. All of Us Speaker Series featuring NIH Director Francis Collins: The All of Us Research Program will launch a Speaker Series in partnership with the National Library of Medicine on Thursday, March 14 at 7:00 PM ET with an inaugural talk by National Institutes of Health Director Dr. Francis Collins. Dr. Collins will discuss the importance of All of Us, how far the research program has come, provide a preview of the program’s future, and take questions from viewers. The All of Us Research Program Speaker Series will be streamed through YouTube Live. Closed captioning in English and Spanish will be available. For more information, visit joinallofus.org/conversations. 2019-2020 Funding Available: NNLM MAR Members can apply by April 5 for up to $50,000 in support of health information outreach projects. Take a look at our current opportunities and application checklist to get started. If you have questions, check out our Funding FAQs for answers. Looking for more information, or assistance in developing your application? Use the MAR Award Interest Form to tell us about your project. Our staff would love the opportunity to work with you! NNLM at NJLA: Are you headed to the New Jersey Library Association Annual Conference in May? Come meet and greet with MAR staff! Check out the NNLM preconference, The All of Us Research Program and Public Libraries, to hear about how public libraries can support health literacy, and to learn about health programming ideas. Attend Health and Wellness 101 to learn about collections, resources, and fun ways to help support community health and wellbeing. The Public Library Association (PLA) has expanded its partnership with the National Network of Libraries of Medicine! Starting this month, PLA and NNLM will team up to raise awareness of the NIH’s All of Us Research Program, a historic effort to gather data from one million or more people living in the U.S., to accelerate research and improve health. NLM Launches a New Exhibition – The U.S. National Library of Medicine (NLM) announces Rise, Serve, Lead! America’s Women Physicians, a banner exhibition and companion online adaptation. The exhibition opens March 18, 2019 in commemoration of Women’s History Month. NIH MedlinePlus Magazine: This quarter, comedian Bob Saget talks about his long-time advocacy for scleroderma. Other featured topics include the Opioid Crisis, Acute Flaccid Myelitis, and the HPV Vaccine. Subscribe to receive NIH MedlinePlus Magazine delivered to your home or office, or order MedlinePlus Magazine in bulk for your library. NIH News in Health: The March 2019 issue is now available, featuring, “The Skinny on Fat: The Good, the Bad, and the Unknown,” and, “Practicing Gratitude: Ways to Improve Positivity.” Other topics include detecting colorectal cancer, and how physical activity may lessen symptoms of depression. Food for Thought: Exploring Nutrition Information Resources – March 18, 1:00-2:00 PM ET – Sponsored by MAR, this class is designed to assist librarians, public health workers, health professionals, and the general public in locating authoritative information on nutrition and topics relating to nutrition. 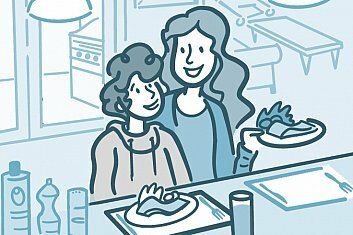 Background information on the importance of nutrition information to other health-related topics will be included, and resources for locating nutrition-related statistics and evidence-based practice will also be identified. PubMed and Beyond: Clinical Resources from the National Library of Medicine – March 18, 2:00-3:00 PM ET – Join MAR for the third in a series of webinars presented for the Association of College and Research Libraries Health Special Interest Group (ACRL HSIG). This presentation will introduce free bedside information resources for the busy clinician. Resources presented will include Clinical Queries in PubMed/MEDLINE and free drug, patient education, and point-of-care resources. Activate, Collaborate, and Educate: Health Outreach and Programming in Your Community – March 19, 3:00-4:00 PM ET – Join MAR for this webinar that will provide an overview of ideas to conduct health outreach and create health programs for libraries and community/faith based organizations. Participants will learn how to integrate resources from the National Library of Medicine (NLM) and other reputable agencies to introduce community members to NLM resources in fun and engaging ways. What’s Nutrition Got to Do With It? An Introduction to Online and Community-Based Resources for Successful Aging – March 20, 11:00 AM-12:00 PM ET – Sponsored by SCR, the purpose of this presentation is to review the mission and vision of Meals on Wheels America – the oldest and largest organization in the United States representing the community-based nutrition and meal services field. In addition, this presentation will review popular nutrition and meal services provided by the nationwide network of community-based senior nutrition programs, and outline the documented impact these services have recipient health and wellbeing. Webinar participants will also learn about high-quality education and training offered by the National Resource Center on Nutrition and Aging – an online resource center, hosted by Meals on Wheels America. Keeping Up with the Information Onslaught – March 21, 12:30-1:30 PM ET – Are you suffering from your own information explosion? How as health information professionals can we sustainably organize all that “stuff” that matters to us while keeping up with the literature for both our customers and ourselves? In this webinar Sponsored by MAR, Helen-Ann Brown Epstein, Informationist at the Health Sciences Library Virtua in Mt Laurel, NJ will further discuss her recent article about organizing your resources sustainably. Learn what, how and why to organize your personal and professional collections. Have no fear of tossing and deleting. She will help us design our very own organizing plan. Health and Wellness at the Library: The Essentials of Providing Consumer Health Services – March 25-April 26, 2019 – Are you interested in consumer health? Does an interactive, robust learning experience with other engaged librarians appeal to you? If so, Join MCR & PSR for this class! Centered around eight core competencies, this interactive 4-week online course provides a rich learning experience to build all the essential skills for providing consumer health information services. Participants are eligible for 12 MLA CE, including credit toward the Consumer Health Information Specialization (CHIS) from MLA. Improving the Health, Safety, and Well-being of LGBT Populations – March 26, 2:00-3:00 PM ET – Join GMR for a 2019 update on health resources for lesbian, gay, bisexual, and transgender populations. LGBT individuals face many barriers in accessing healthcare, including discrimination, lack of access, misunderstanding, and fear. As a consequence, many LGBT individuals do not regularly access appropriate and timely care. The more informed healthcare professionals are, LGBT patients and clients will become more comfortable in an environment that is often alienating, disrespectful, and traumatic. This class will discuss cultural competency, health information needs, and information resources for working with LGBT patrons. New to this course: resources for emergency preparedness and response. PubMed for Librarians: Introduction to PubMed – March 26, 2:00-3:30 PM ET – Attend this class with NTO to learn about the difference between PubMed and MEDLINE, how to run a basic PubMed search, assess your search results, analyze search details, customize PubMed with My NCBI, search for a known citation; plus, brief introductions to MeSH, automatic term mapping, search tags and subheadings. ToxTutor – March 27, 3:00-4:00 PM ET – Join PNR for the next NNLM Resource Picks, our collaborative, bimonthly, webcast series featuring the National Library of Medicine resources. This session will focus on ToxTutor, a self-paced toxicology tutorial, including the history of the resource, how it has evolved over the last 20 years, and the most recent updates and enhancements from 2018. Getting Started with Information Outreach in Your Community: An Introduction – March 28, 3:00-4:00 PM ET – Sponsored by GMR, this class will provide a background in cultural competence and outreach skills as librarians make outreach efforts to underserved, underrepresented minority populations in their community. The goal of this course is to offer concrete ideas to enable librarians to initiate outreach programs with these populations. Topics include locating community demographics, the importance of developing relationships, the basics of building and developing community-based partnerships, recognition and acceptance of cultural differences, and the importance of cultural competency. Astronaut Health: Science Education Resources – April 23, 12:00-1:00 PM ET – Join SCR for the first online offering of this course and get ready to spend this summer celebrating the 50th anniversary of the Apollo moon landing with your community and network partners! Instructor Debbie Montenegro, NNLM SCR Consumer Health Coordinator and recently recognized NASA Solar System Ambassador, will walk through various resources from NLM, NIH, and NASA, as well as wonderful communities of practice that are ready to help you get your summer programming together. Get ready to explore where space and health resources collide! *Please note that the class registration system requires obtaining an NNLM account prior to registration. Learn how to register for classes from the NTO. #RuralHealthChat: Rural Health Workforce Education and Training – Join RHIhub on Monday, March 18 at 2:00 PM ET for a Twitter chat to discuss the education and training of the rural health workforce, including how rural training is different, factors that determine how likely a student is to practice in a rural area, and strategies to improve your rural community’s rural health workforce. Use #RuralHealthChat to join the conversation! Join the Megathon Challenge to Help Accelerate Alzheimer’s Research – April 13th is Citizen Science Day, aimed at involving everyday folks in carrying out real-world scientific research. Public libraries and their communities will have the opportunity to participate in the Megathon Challenge from 1:30 to 3:30 PM ET to help speed up Alzheimer’s research by playing an online game called Stall Catchers. Your efforts will help answer important questions about a drug that could be used in Alzheimer’s disease treatment. Enlisting the aid of citizen scientists who play the game could save researchers a year in sifting through data for the project. Blockchain & Decentralization for the Information Industries – March 11-April 21, 2019 – Blockchain technology is a trend on the brink of revolutionizing the public and private sectors, and it is on the radar of many who are curious about its global disruptive potential for accessing and sharing information among individuals, organizations, and governments. This San Jose State University MOOC will provide a background for individuals involved with libraries, urban planning, government agencies, publishing & other organizations to understand the issues and applications of distributed ledger technology. The topics will include: overview of blockchain technology; implementation issues, considerations, and challenges; related decentralized systems; potential applications; and, future directions. Preparing Adolescents for a Lifetime of Investing in their own Healthcare – March 14, 1:00-2:00 PM ET -The Hospital and Healthsystem Association of Pennsylvania (HAP)’s Person and Family Engagement Council member Linda Miller will be one of the featured presenters on this state-wide webinar. As a high school health teacher, Linda developed a core health topic for her 10th grade students with a hope to change the way we educate our youth as it pertains to their self-care and communications with health care professionals. In addition to Linda, the webinar will include two individuals from the Adolescent Health Initiative at Michigan Medicine. These individuals help to run a program designed to empower youth to actively participate in their own health care for lifelong engagement in the health system. This one hour webinar is appropriate for anyone interested in patient engagement and teaching others how to take an active role in their care. It is offered at no cost and a certificate of attendance will be provided. Take Your Research Guides from Good to Great – March 14, 2:00-3:30 PM ET – Take your research guides from good to great with techniques and guidance from an experienced web professional and LibGuides expert! Learn how to make your guides user friendly on multiple device types; how to identify and fix accessibility problems, especially for users with disabilities; and how to get user data that enable you to improve your guides and demonstrate their impact. Sponsored by MLA; $65 for members / $85 for non-members. Serving Patrons with Disabilities in Your Library or Clinic – April 17, 2:00-3:30 PM ET – Learn how to create welcoming environments for and communicate clearly with people with disabilities in academic and hospital settings. Through a hands-on activity, discussion, live quizzes, and information on resources that address the health information needs of people with disabilities, you will be better able to assist patrons with disabilities and the clinicians who treat them. You will leave with ideas for immediate improvements to your website and quick fixes to your library space, guidelines for clearly and confidently communicating with people with disabilities, and knowledge and skills for making plans for larger improvements. Sponsored by MLA; $65 for members / $85 for non-members. Mobile Technologies Extending Reach of Primary Care for Substance-Use-Disorders – The National Institute on Drug Abuse (NIDA) is seeking grant applications to develop and test a prototype mobile/tablet technology-based application suitable for U.S. primary care settings, to serve as a low-cost user-friendly tool that primary care providers (PCPs) may use to deliver timely tailored feedback to patients following up on interventions for risky substance use. It should be designed with a specific aim of improving coordination and delivery of indicated services to primary care patients at risk of developing substance use disorders (SUD). The application deadline is March 19, 2019. 2019 Summer Intramural Fellowship Program – The Agency for Healthcare Research and Quality (AHRQ) is soliciting applications for time-limited Fellowship opportunities. AHRQ’s mission is to produce evidence to make health care safer, higher quality, more accessible, equitable, and affordable and to work with the HHS and other partners to make sure that the evidence is understood and used. The AHRQ Intramural Fellowship Program provides opportunities for individuals to work with leading health services researchers in the conduct and support of research on “real life” issues that support the Agency’s mission and contributes to improvements in health care. Fellows are also afforded the opportunity to work with administrative protocols, gain access to AHRQ-sponsored data sets, and apply statistical analysis methods to broaden the Fellow’s understanding of health services research and the Agency’ effect on the healthcare system. The deadline to apply is March 26. Create an obesity prevention game for the chance to win! Join the Office on Women’s Health in helping women and girls live healthier lives with Shape of Health: An Obesity Prevention Game. Research shows that video games can help improve health, so we’re challenging organizations and individuals to create a web- or mobile-based game focused on obesity prevention or weight control. Submit your concept by March 31 for the chance to win up to $77,000 in prize money! Innovations for Healthy Living – Improving Minority Health and Eliminating Health Disparities – The National Institute on Minority Health and Health Disparities (NIMHD) invites Small Business Innovation Research (SBIR) grant applications that propose to conduct innovative research supporting the development of a product, tool, technology, process or service for commercialization with the aim of eliminating disparities in socioeconomically disadvantaged populations, underserved rural populations, and sexual and gender minority populations or improving health in racial/ethnic minority populations. The application deadline is April 1, 2019. Coming Soon: An Updated PubMed! The NIH Director’s Blog: Can a Mind-Reading Computer Speak for Those Who Cannot? Circulating Now: Happy Birthday, Dr. Seuss! Announcing the first ever RNA-Seq in the Cloud hackathon! The term “interprofessional education” (IPE) pops up a lot these days in the health sciences literature. What is it, and how can we best put it into practice? The University of Washington Health Sciences Library (UW HSL) was awarded a Community Health Outreach grant from the National Network of Libraries of Medicine’s Pacific Northwest Region to put on a one-day conference on interprofessional education in the health sciences. It was timed to coincide with the American Library Association’s (ALA) Midwinter Meeting in Seattle to attract more librarians, but was also open to faculty, staff and students at UW. Over forty people attended, with librarians the majority group. 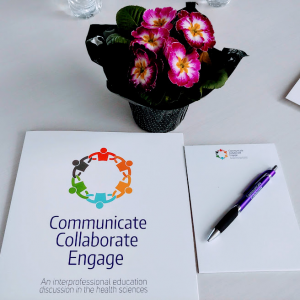 The theme was Communicate Collaborate Engage: An Interprofessional Education Discussion in the Health Sciences, and focused on IPE faculty development and community engagement. The program consisted of three speakers and a panel of community members who have put IPE into practice. Two activities were integrated into the program including Impromptu Networking which was led by UW HSL’s Nikki Dettmar and a project charter activity, led by UW’s Institute of Translational Health Sciences’ (ITHS) Lean Specialist, Jennifer Sprecher. Maria Wamsley, MD, from the University of California San Francisco (UCSF), spoke on From the Classroom to the Clinic: Meaningful IPE in Workplace Settings. She discussed how UCSF has set up teams in the hospital with a fixed nurse, social worker and pharmacist, in addition to attending physicians, residents, interns and students. There are regular meetings with the team where the benefits have been a greater appreciation of each member’s role and the importance of shared knowledge. Jennifer Sprecher, ITHS, spoke on the skills which make an effective team, which in turn is what drives an IPE group’s success. Jennifer and Nicole Summerside also spoke on Collaboration and Continuous Learning across the IPE Continuum: Lessons Learned and a Look Ahead. Highlights included that miscommunication coupled with inadequate care coordination, particularly for chronic conditions, has led to unnecessary deaths and problems. IPE helps in the pursuit of the Triple Aim by improving the patient experience of care, improving the health of populations, and reducing the per capita cost of health care. The community engagement panel included a clinician, a student and a community partner. Julia Coulson, who runs an annual health clinic which takes place in the local basketball stadium and treats 4,000 patients over 4 days, manned by volunteer doctors, dentists, optometrists, nurses, and others. The panel was moderated by Tracy Brazg, Assistant Director of the UW’s Center for Health Sciences Interprofessional Education, Research and Practice (CHSIE), the coordinating body of IPE for the UW’s health sciences schools. A diverse mix of attendees enjoyed lively discussions on what lessons each person could take back to their practice. The assessment/evaluation forms that were turned in were unanimously positive, with people saying they had come out of the program knowing more about IPE, wanting to bring it to their institutions, and also wanting to develop an ongoing community conversation. The planning committee at UW HSL included Andrea Ball, Nikki Dettmar, and Lynly Beard with fiscal support from Mary Martha McNally and administrative oversight from Emily Patridge. The All of Us Research Program will launch a Speaker Series in partnership with the National Library of Medicine on Thursday, March 14 at 7 p.m. ET with an inaugural talk by National Institutes of Health Director Dr. Francis Collins. Dr. Collins will discuss the importance of All of Us, how far the research program has come, provide a preview of the program’s future, and take questions from viewers. The All of Us Research Program Speaker Series will be streamed through YouTube Live. Closed captioning in English and Spanish will be available. For more information, visit joinallofus.org/conversations. The National Network of Libraries of Medicine (NNLM) and the Public Library Association (PLA) have joined together to raise awareness and support of the National Institutes of Health’s All of Us Research Program. The NNLM and PLA have worked together to increase health literacy through programming and consumer health information over the last couple of years. This new collaboration will support community engagement around All of Us by elevating the role of public libraries in locating reliable health information and creating connections through library spaces and technology. This partnership will provide health information training for public library staff, funding to support library health related programming and services, and connections to local medical libraries and community organizations. Learn more about this partnership in the ALA News announcement. NNLM’s collaboration with the NIH’s All of Us Research Program is called the NNLM All of Us Community Engagement Network. Learn more about this collaboration and how public libraries can participate. As the biomedical literature increases at a significant rate in PubMed, NCBI has continuously experimented and investigated ways to improve the overall search quality and user experience. An updated version of PubMed, which will eventually replace the current version, is now available on the experimental PubMed Labs platform. The updated version of PubMed includes the following features. To see graphical illustrations from PubMed Labs, visit the NLM Technical Bulletin. PubMed now offers a new relevance sort option named Best Match as an alternative to the default date sort, making it easier for users to find what they seek. Best Match uses a state-of-the-art machine learning algorithm that is trained on aggregated user searches. The Best Match algorithm ranks search results according to several relevance signals, including an article’s popularity, its publication date and type, and its query-document relevance score. Full details about Best Match are available in the PLOS Biology article, Best Match: New relevance search for PubMed. Search results now include snippets, which are highlighted text fragments from the article abstract that are selected based on their relatedness to the query and give users additional information to help them decide if an article is useful. Additional improvements to the interface make it easier to discover related content, e.g. similar articles, references, and citations. Also, in the updated version of PubMed, the underlying document data that is indexed has been newly generated by merging content from PubMed, Bookshelf, and PubMed Central (PMC), so that relevant information not ordinarily available in a PubMed record, e.g. reference citations from PMC, can be displayed. The updated PubMed features a mobile-first, responsive layout that offers better support for accessing PubMed content with the increasingly popular small-screen devices such as mobile phones and tablets. The interface is compatible with any screen size, which provides a fresh, consistent look and feel throughout the application, no matter how it is accessed. The updated version of PubMed uses Solr, an open-source enterprise search system, for document indexing, and MongoDB for storage and retrieval. In addition to its scalability and reliability, Solr also provides many powerful out-of-the-box search functionalities, such as wildcards (‘*’), groupings, and joins. For example, unlike the current version of PubMed, the updated version does not limit the number of variants for wildcards. The MongoDB storage solution provides default data replication between different data centers, which ensures redundancy. The updated PubMed runs on a modern cloud architecture that provides scalability and a reliable backup environment. The updated PubMed uses the Django Web framework on the front-end, making use of the latest web technologies and standards. The updated PubMed continues to be validated by prioritizing and aligning features based on user research including usability testing and continuous feedback from users. Please note the updated version does not include the complete set of features currently found in PubMed; however, NLM is iteratively adding functions and improving the system. Feedback is welcome! Submit comments, questions, or concerns using the PubMed Labs Feedback button. The Public Library Association and the National Network of Libraries of medicine are joining together to support the National Institute of Health’s All of Us Research Program in an effort to accelerate research and improve health. Find out more about their partnership by going to ALA news. New NLM Exhibition Opens March 18 to Celebrate Women’s History Month! The National Library of Medicine has announced the launch of Rise, Serve, Lead! America’s Women Physicians, a banner exhibition and companion online adaptation. The exhibition opens March 18, in commemoration of Women’s History Month. Rise, Serve, Lead! highlights the lives and achievements of over 300 women physicians who have made a difference through their medical practice and research, work as activists, service as administrators, and mentorship to the next generation of physicians. It presents a selection of the physician biographies featured in the 2003 NLM exhibition, Changing the Face of Medicine: Celebrating America’s Women Physicians, showcasing the work of these doctors to connect to a contemporary audience. The online adaptation of Rise, Serve, Lead! includes an education component featuring a new K-12 lesson plan and a digital gallery of works from NLM Digital Collections. These books and journal articles were authored by some of the doctors profiled in the exhibition and give a view into both their scientific research and experiences in a male-dominated field. The banner exhibition will be on display through the month of March in the Rotunda of the first floor of the NLM Building 38 on the Bethesda campus of the NIH. March 2019 Issue of NIH News in Health Now Available! Find out which fats to add to your diet and which to replace. Make a habit of noticing what’s going well in your life. It could have health benefits. NIH News in Health has a conversation with Dr. Krauss, an NIH-funded researcher who studies dietary fat, blood cholesterol, and heart disease risk at the UCSF Benioff Children’s Hospital Oakland. Many tests are available that can detect colorectal cancer during its early stages. Physical activity can help improve your health and quality of life. Not getting enough can increase your risk for some diseases and mental health issues. Follow NIH on Facebook, Twitter, Instagram, Pinterest, and more! You can also sign up for health newsletters that interest you to keep up with the latest. Or, watch videos and listen to podcasts on our YouTube and iTunes channels. Does this sound familiar? Your institution’s records are relegated to boxes in a back room, basement or or simply tossed without review. Join us on Thursday, March 14th 2019, from 1:00 PM to 2:00 PM as we host Nadia Dixson, the Somerville City Archivist, as she presents, “How Did We Get Here: Maintaining Records for Long Term Institutional Memory.” Avoid costly mistakes, and even see a return on investment, by learning how to identify, preserve, and maintain appropriate historic records. This webinar introduces practical information and tools necessary to identify records of enduring value and start an archives program that will benefit your institution and preserve institutional memory. For the March session of Breezing Along with the RML, we will hear from two network members who attended the Implicit Bias, Health Disparities, and Health Literacy: Intersections in Health Equity preconference that was offered at the American Library Association Midwinter Conference in January 2019. You’ll also hear more about how these preconference attendees received professional development funding from the National Network of Libraries of Medicine, MidContinental Regional Medical Library that made their trips possible. April 13th is Citizen Science Day, aimed at involving everyday folks in carrying out real-world scientific research. Public libraries and their communities will have the opportunity to participate in the Megathon Challenge from 1:30 to 3:30 pm EST to help speed up Alzheimer’s research by playing an online game called Stall Catchers. Stall Catchers is a citizen science game where players, also known as “catchers,” around the world analyze real data. The app is part of the EyesOnALZ project led by Cornell University. Players review recorded images of blood vessels in the brains of mice and try to identify the vessels as flowing or stalled. Anyone from the ages of 6 to 88 years old can participate. No specific knowledge or scientific background is required. Why should I join the Megathon Challenge? Your efforts will help answer important questions about a drug that could be used in Alzheimer’s disease treatment. Enlisting the aid of citizen scientists who play the game could save researchers a year in sifting through data for the project. How can I become a catcher? To join the “catching” event, sign-up at https://stallcatchers.com/megathon-register#info. Once you’ve joined, you will be taken to Stall Catchers to start practicing and to become familiar with the game before the main event. Can my library host a Megathon Challenge event? Yes! Your library can be a part of the worldwide event by filling out an easy online form. To learn more about how your library can get involved, visit SciStarter to find helpful tools and resources. They include the Librarian’s Guide to Citizen Science, which provides the information you need to succeed with citizen science activities at your library. Establishing your library as a place for your community to practice citizen science will aid research while allowing your patrons to understand their world better. A devastating series of tornadoes ripped through Alabama on Sunday, killing at least 23 people in one county. It is impossible for NNLM SEA to know which of our network members have suffered loss or damages based upon news reports. Have you, your library or organization experienced ill effects from the tornadoes? Is there good news after the tornadoes that you would like to share with our network members? Health Information Guides on topics including floods, tornadoes, and fires and wildfires. We would like to hear from you! Please e-mail our office at e-mail HSHSL-NLMsea@hshsl.umaryland.edu, or share in the comments section of this post. Let us know; we want to hear from you! In observation of Women’s History Month, each week of March the Dragonfly will feature a National Library of Medicine exhibit that highlights the history of women in health, science, and society. This week highlights the nursing profession through the “Pictures of Nursing: The Zwerdling Postcard Collection“. The nursing profession is made up of about 3 million registered nurses in the United States and many more world wide and is one of the most diverse professions available. Nursing began within the home with women taking care of ill or incapacitated family members. Since then, nursing has expanded to include not only women but men as well. Nurses work in a variety of settings including but not limited to hospitals, clinics, K-12 schools, research labs, universities, long term care facilities, law firms and even in libraries. A nurse may work independently and collaboratively, and nurses are now many patient’s primary healthcare provider. Nurses have been instrumental in promoting the health of individuals and communities as well as in progress of clinical care, public health, and scientific advancements. We celebrate and honor the work of nurses of the past, the present and the future during Women’s History Month and all year long. The National Library of Medicine (NLM) History of Medicine Division acquired an archive of 2,588 postcards from American nurse and collector Michael Zwerdling, RN. This unique archive consists of postcards with images of nurses and the nursing profession from around the world, produced between 1893 and 2011 with many examples coming from the “Golden Age” of postcards—roughly 1907 to 1920. These images of nurses and nursing are informed by cultural values; ideas about women, men, and work; and by attitudes toward class, race, and national differences. By documenting the relationship of nursing to significant forces in 20th-century life, such as war and disease, these postcards reveal how nursing was seen during those times. Pictures of Nursing provides a way to understand the types of images that are represented in the full collection. The online exhibit includes a digital gallery of over 500 images from the postcard collection. Viewers can browse through a selection that highlights nurses, the nursing profession, and nursing as informed by cultural values. 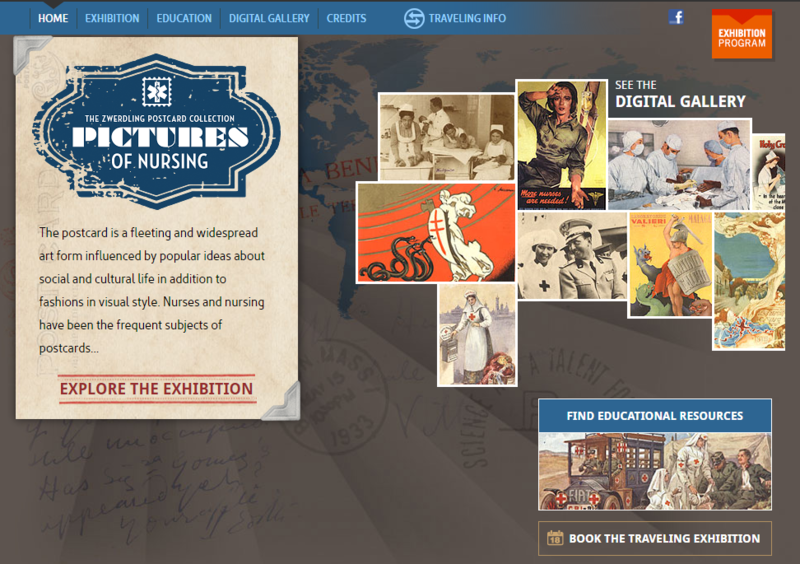 In addition, educators will find a lesson plan for high school students to examine some of the postcards visually and to consider how images affect social perception of nursing. A higher education module encourages students to consider the complex relationship between idealized American gender roles, wartime propaganda, and female military nurses’ real experiences during World War I and World War II. Pictures of Nursing is also a traveling exhibit which your library or organization may wish to host. Learn more about booking the exhibit on its Book An Exhibition web page. Want to visit the exhibit? It will be at the Lewiston City Library in Lewiston, ID Januay 6 – February 15, 2020. March features National Nutrition Month, Women’s History Month and National Poison Prevention Week. Libraries can engage their communities in these health-related celebrations with helpful resources and promotional materials offered by the National Network of Libraries of Medicine. The materials are part of a campaign that NNLM is launching to supply libraries with materials and programming ideas based on noteworthy national health observances like National Immunization Awareness Month in August or Family Health History Day in November. The selection of available materials will be updated monthly as new health observances approach. Nutrition Month Library program kit: The NHO nutrient month program kit: The kit has a creative and easy guide filled with an activity plan and health information resources on nutrition that anyone can use at their library. The MAR offices will be closed Monday, March 4 and Tuesday, March 5 while we attend an NNLM staff Summit. We will respond to all requests when we return. Introduction to the Unified Medical Language System (UMLS) – March 7, 2:00-2:40 PM ET – The Unified Medical Language System (UMLS) is a set of files and software available from the U.S. National Library of Medicine (NLM) that brings together many biomedical vocabularies and standards for drugs, disorders, procedures, lab tests, medical devices, organisms, anatomy, genes, and more. Join David Anderson from NLM for this brief overview of how researchers and organizations can use the rich collection of terminology data in the UMLS to enhance interoperability and discoverability in research and clinical applications. National Library Week 2019: The Pennsylvania Library Association is pleased to offer a media toolkit to be used for celebrating National Library Week in April. Included is a proclamation template, press release template, interactive display idea, patron comment card/quote collection form, social media hashtags, and resource links. You are encouraged to customize the materials with your own library information and use these for outreach to your local media including radio, TV, newspapers, and also for your own newsletters, community engagement, and programming. NMRT March Live Chat: Harnessing Social Media for Promotion of your Library Services: Join NNLM All of Us Community Engagement Coordinator Veronica Leigh Milliner and other members of the American Library Association’s New Members Round Table on March 12 at 2:00 PM ET for this Twitter chat! Hear and talk with others about what your library is doing to harness social media or what new and innovative ideas you would like to try to market your services via social media. Look for @caseytitsch and use #nmrtchat on follow and join the conversation on Twitter! Mini-grant Funding for Health Outreach in Public Libraries: PLA’s health insurance education initiative, Promoting Healthy Communities: Libraries Connecting You to Coverage, is part of a national partnership made possible by funding from the Robert Wood Johnson Foundation (RWJF) and Community Catalyst. The Public Library Association (PLA) is offering funding for public libraries to implement consumer outreach and education activities around health insurance and health information. Up to 70 U.S. public libraries will be awarded $500 mini-grants through the application process. The Round 2 mini-grant application will remain open until 12:59 AM ET on Wendesday, March 6, 2019. Priority will be given to recipients of first-round, Libraries Connecting You to Coverage funding, and grant-associated activities must be completed by May 1, 2019.